When we were growing up, before going off to school we ate thairu saadu. Yogurt rice filled our stomach well and we were ready to walk more than a mile or so to school and ready to learn. This is also one of the delicacies of South India. 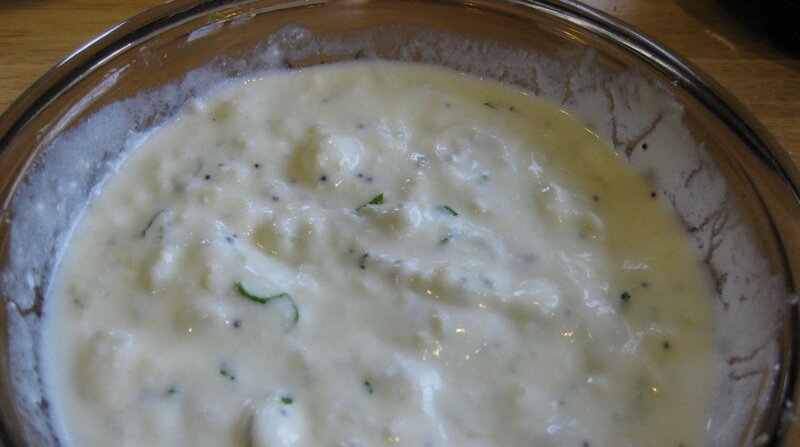 In South India, lunch or dinner is never complete without eating yogurt rice as the last item. Children usually come to know this and then if they do not want to eat anymore, they say they ate yogurt rice already. In South India, we have a well balanced diet. Yogurt rice gives us our dairy (with plenty of protein and natural cultures) requirement for the day. Continue reading for the full recipe. 2. Let the rice cool. Knead the rice with your hand until the rice is a bit smashed and sticky, for about 1 minute. Yes, I meant hands. Rice will not mix as well with serving spoons or anything else. 3. Mix the ginger and the cilantro and a tablespoon of sour cream and a tablespoon of yoghurt and the salt. 4. Now you can mix everything together with a serving spoon. 5. Heat the oil in a small sauce pan on medium heat and add the mustard seeds. Cover the sauce pan. When the mustard seeds start crackling and popping, turn off the heat and add the seeds to the mixture of rice. 6. Just before serving, mix more yoghurt and/or butter milk and bring to a good consistency. Here are some other optional things you can add and/or keep on the side to be mixed with the yogurt rice. Heat ½ teaspoon of channa dal in a tea spoon of oil till the dal turns golden brown.